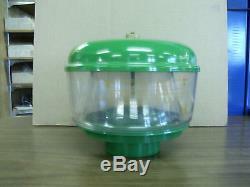 New pre cleaner assembly with metal lid with brass nut, plastic bowl, and metal base. For JD 520 530 620 630 720 730 tractors. Will fit others, has yellow lettering like original. The item "Precleaner kit for John Deere 520-730 tracors" is in sale since Wednesday, January 4, 2012. This item is in the category "Business & Industrial\Heavy Equipment Parts & Accs\Antique & Vintage Equip Parts". The seller is "w-farms" and is located in Logansport, Indiana.